i picked the worst possible time to leave manila: on the eve of a long weekend, when everyone else is lured by this unoriginal idea of going away for a quick holiday. at a time when air travel has been made more accessible by budget airlines, more and more people are flying, and flying all at the same time. i have missed a few flights in my history as a frequent flyer, including one to kuala lumpur, when a sudden downpour caused the pasay road to flood, and traffic was held to a perfect standstill. so although i still had 2 hours to spare, i grabbed an über ride even though it had a surge pricing of x 3.9. 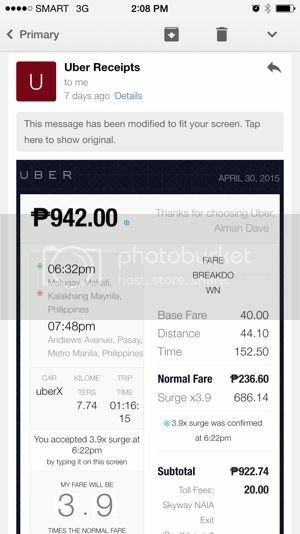 (seriously, who pays more than 900 pesos to get to the airport from makati? someone desperate and anxious about missing another flight like me!) my driver was a glib man who regaled me with stories throughout our slow crawl to the airport, and i learned many things about him. when we got down from the skyway, we were just inching past newport city, and i decided to get off and just cross the street to terminal 3. underneath the construction that is the NAIAEx is a pedestrian access path to T3’s parking building. i had to trot to the entrance which was at the other end of the arrival area, then go up to the departure floor to check-in. none of the counters had my destination, so i had to ask. they said they had just closed the check-in counters, since it was exactly 45 minutes to the scheduled time of departure. 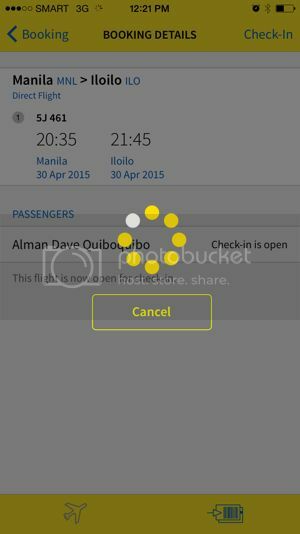 and this is where i talk about the point of this entry: the cebu pacific air app. online check-in has been possible for a long time, and airlines in the philippines are not among the first to adopt the system. cebu pacific was the first to implement it locally, and i remember trying it once when it was new and ended up lining up longer than regular check-in since there was only 1 bag drop counter available and a lot of people thought that it would also facilitate a better airport check-in experience. self check-in was made available over a year ago, if i’m not mistaken, and you can now find these yellow kiosks at the terminal where you key in your booking reference number and name. i’ve tried is a few times, and realized it was not always responsive or available. some people just gave up on it. on one occasion, i had to try 3 different terminals to get my boarding pass. in other countries, self check-in is fully-automated, including checking-in of baggage. 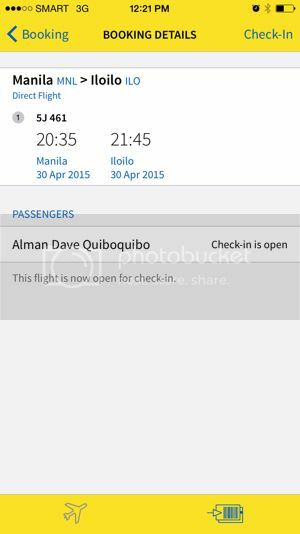 but late last year, without fanfare, cebu pacific launched its own smart phone application to allow airline passengers to buy tickets and check-in using their smartphones. of course it has been possible to use mobile devices to check-in online since it was introduced, but going to cebu pacific’s website using a phone has certain disadvantages, particularly since at the beginning, the airline required you to print out your own boarding pass if you opted to check-in online, and there was a temporary uproar about airline employees briefly refusing electronic documents, telling passengers who flashed their mobile screens instead of to present printouts. besides, the webpage has been designed to be accessed using larger screens, and a tablet might give a more inclusive experience, but even the biggest smartphones could not provide the same ease as would laptops or desktops. 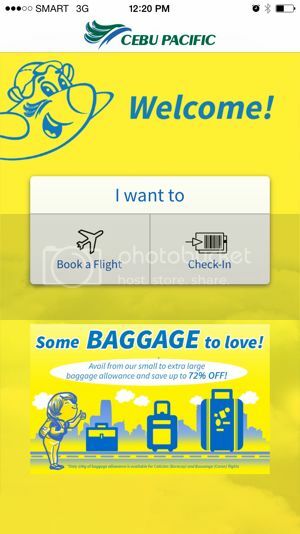 the cebu pacific application has changed all that by allowing mobile check-in in a format that’s appropriate and convenient for those who don’t have access to computers. all you need is an iPhone, since it is currently only available in the apple store and runs on iOS (android devices should be able to use it soon). and the experience of checking-in has since been amazingly fast and convenient. i’m not exaggerating when i say that during my last flight, it literally took me under two minutes to get checked-in, which i did while i was eating lunch. just take a look at the sequence of screen captures from my phone, and the time it took me from beginning to end is clearly shown, although internet speed might also play a role in how fast the experience would turn out to be, and it was blazingly quick for me despite just being on 3G. the best part is that the airline staff didn’t wince when i showed my phone to prove that i’ve checked-in, and i was never asked to present a print-out at the airport gate and at the counter. the app still has its limitations. while it allows you to book flights and check-in up to 4 hours prior to your scheduled flight, it doesn’t allow you to manage a booking, such as when you want to reschedule a flight, purchase a seat, or prepay for additional baggage allowance. 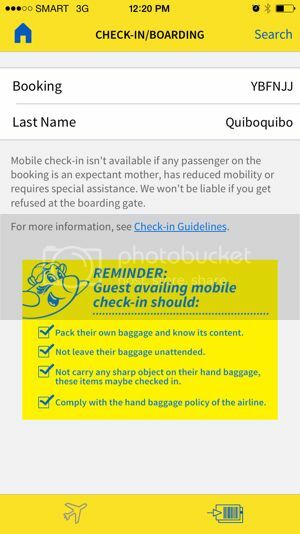 if i’m not mistaken, some of these features (such as buying a seat) were possible when checking-in using cebu pacific’s website, but these have not yet been integrated into the application. i’ve checked-in using the app for at least 6 flights since january, and each time, it’s always been a breeze. i highly recommend the cebu pacific app, if you have to fly cebu pacific, which i don’t recommend, but am compelled to patronize for the reason that i cannot afford the convenience and better service of legacy airlines. 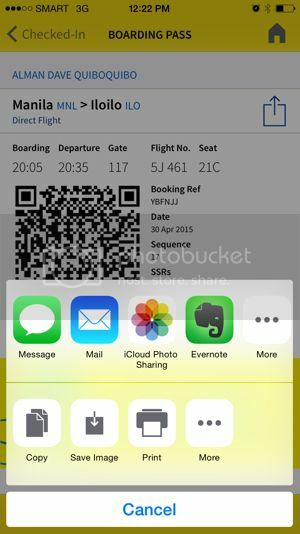 my one small gripe at the moment is that i hope the cebupac app seamlessly interfaces with the iPhone’s passbook app, which was designed to centralize coupons, tickets, gift certificates, boarding passes, etc. so thanks cebu pacific. the seat pitch still discriminates even against people like me of average height, but you’ve proven once again that yes, there’s an app for that. 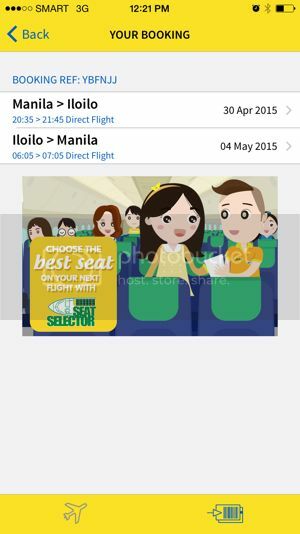 by the way, this is an unpaid, impartial, and independent review of cebu pacific's iPhone app. the opening screen asks you want to do, and when checking-in, you only need to know your booking reference and your last name. the booking reference is easy to find. 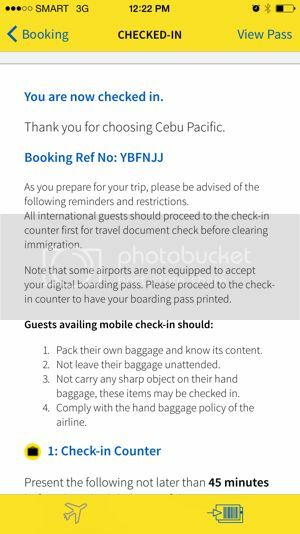 since you're already online, you can check your email and copy/paste the code from the email sent by cebu pacific, which is what i did. 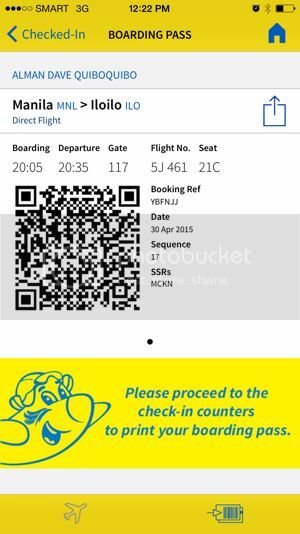 the flights linked to the booking reference appear, and you just click on the flight for which you want to do mobile check-in. you have to click on the words "Check-In" on the upper right hand corner of the second screen. at this point, this doesn't feel like the best place to put this button, but it makes sense later. and just like that, you're checked in. you can stop here, because cebu pacific will know that you're checked-in once they check their computers based on your booking reference, but i continued with the process anyway. i clicked on "View Pass", and the next screen is what i captured, which tells me my seat number, my assigned gate, and the boarding time. the QR code is, as i've said, superfluous since you only need the 6-letter reference to get your boarding pass print out at the counter. perhaps it would serve a purpose at some later stage when the check-in process is completely automated and independent (i.e., unmanned or unwomanned). i proceeded to the next step just to see what else the app could do. 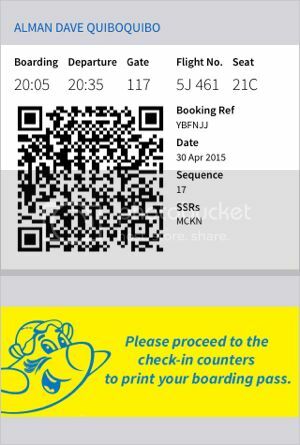 i already have a screencap of my boarding pass (again, superfluous), but by pressing on the 'send' button (which in the iPhone is represented by a box with an arrow pointing up), you're allowed to send the boarding pass to someone via email, through iMessage, or open it on evernote, or upload to the iCloud. this also means you can use the app to check-in for someone else and just send them the boarding pass as proof you've done it. it also allows you to save the pass (see the image on the right), in case you haven't screencapped it, or in case you doubt whether you'll have internet access at a later time, or get a printout. although really, if you've checked-in using the app, it just pays to remember the booking reference.